Not exactly a repair tutorial but rather more of a tune up for the shutter. As many have experienced the XA series shutter button can become unresponsive. I retired my xa2 last year as a result of shutter button issues. Recently I picked up a couple of XA2 cameras for a few bucks and wanted to dig into the issue. It was easy to fix. I'm sorry I did not take better images for a tutorial. I was not expecting to post a thread but now that things worked out well… I thought I would share my experience and the iPhone documentation images. 1 Open the self timer lever and Remove the bottom plate (5 screws). 2 Carefully remove the clamshell cover watching not to loose the stop bearing. 3 Remove the rewind knob and top plate. Carefully pull the top plate off. 4 Remove the three screws holding the shutter button assembly together and in place. 5 Clean all contacts with white vinegar and gently pull the 4 contacts of the shutter button outward to re-spring some new tension. 6 Re-assmble. Test the door repeatedly before putting the bottom plate back on. It took me a few tries to get the bearing in the right place. In the end I found it easiest to put the bearing into one of the stop slots in the clamshell cover and reassemble the camera upside down. Once the door slides smoothly all is good to go. Here you can see the bottom cover is off as is the top clamshell. The little "barrel" shaped bearing is clear to see. The screw parallel to the bearing does not need to be removed. 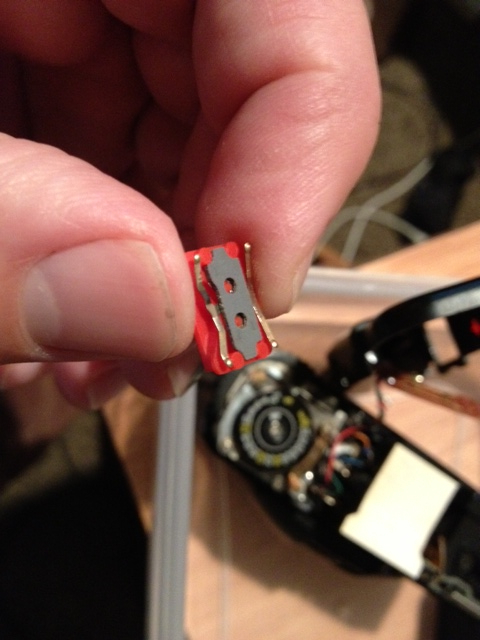 Here the top of the camera is removed. 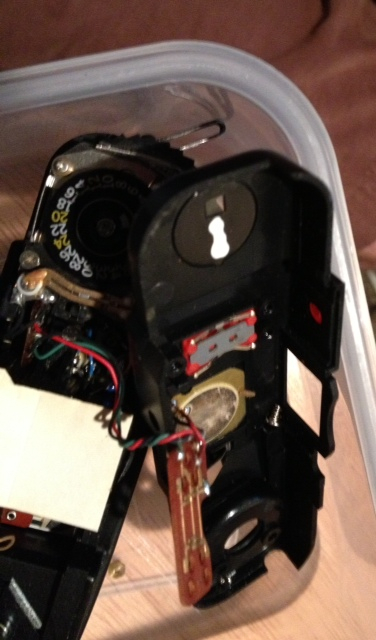 Next is to disassemble the shutter button unit (brown board). Here is the assembly opened up. Clean all the contacts on the underside of the brown board. 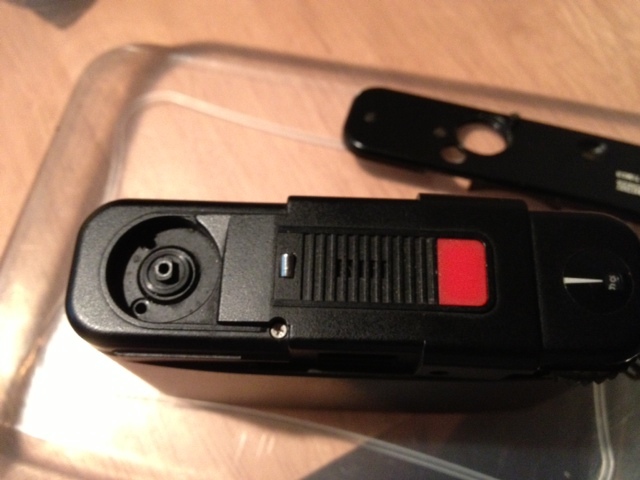 Here is the bottom of the red shutter "button". Clean and ready to re-assembly. I gently pulled the tips of those 4 tabs to put a bit more spring in them. Now with new tension the shutter is responsive and feather light as it was when new. Thanks! This may give inspiration to some of who have put them away because of tricky shutter release. I'm not great at tutorials. This problem is well known but little on how to fix it. Hopefully someone can find some success with this thread. Just did the same trick and now it is much better than before (I mean I still need to direct fingertip top down on button as my fingers aren't so tiny as camera may require). Thanks for the tip! p.s. btw there's no need to remove bottom cover fully, just loosened to take out botton slit of front cover. Any tips on how to get the spring back where it needs to be when reassembling the rewind knob (screwing it back in place)? 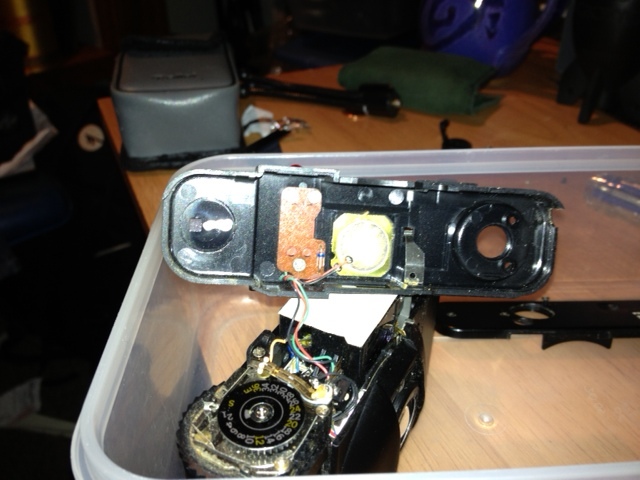 Just re-assemble my XA2 following the instructions above. The self timer works (beeps, etc. )when I press the red shutter button, but the shutter doesn't fire. So it appears contact is being made, but the shutter won't release. Anything I can do more? I'd forgotten that you had posted this... because I didn't need it then. And thanks, Solinar, for bringing it to our attention. "The Little Crow Who Could Not CAW"
is now available for Kindle and other readers. Available from Amazon.com, of course. My XA2's shutter button works fine, but I always have to make sure the sliding cover is COMPLETELY open - I mostly have to keep the forefinger of my left hand pushing the lower edge of the door left. Can anything be done about this? Any adjustment of the contact signalling the cover is open? Hope someone can chime in with some advice. I got my XA2 firing again. Too easy!